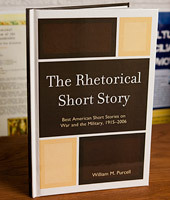 In 2001, William Purcell was searching for short stories to use in his freshmen class, University Core 1000. The SPU associate professor of communication turned to the well-known Best American Short Stories series and began to notice several short stories about war and the military. As a rhetorician, he was intrigued, and soon he began collecting war stories. Purcell cast a wide net for wartime tales, and his book includes every war from World War I to the Iraq conflict. The Rhetorical Short Story includes excerpts from nearly 100 short stories gleaned from decades of the Best American Short Stories series. Many focused on women’s issues (both on the home front and in the military). Others looked at racial integration (both on the home front and in the military). Others grappled with injustice (Japanese internment on U.S. soil and German concentration camps). Before the United States had entered World War I, Purcell discovered, short fiction distinguished between the European war and American concerns. Once America entered the war, short stories included tales about patriotism during a noble struggle. Purcell discovered that it often took decades before an injustice was addressed in story. “Nobody mentions the Japanese internment at the time it occurred,” he says. “But then in the 1970s, writers began writing about it.” Likewise, he found the tragedy of concentration camps only hinted at by the mid 1940s.